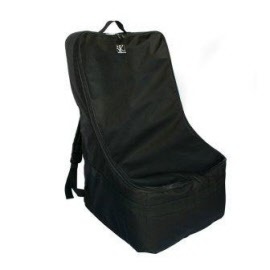 The ULTIMATE car seat travel bag protects your valuable car seat when travelling and provides a convenient and comfortable way to lug it around. 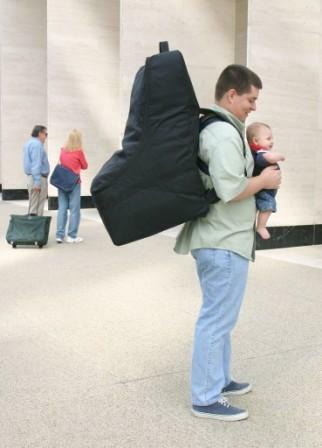 Perfect for use when checking your car seat as luggage. 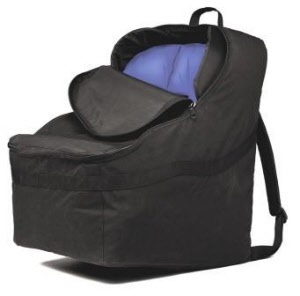 The Ultimate is the only car seat travel bag available that offers thick padding on all sides and padded interior wings to protect your car seats' safety features, plus padded harness-style backpack straps to ensure comfortable carrying. The backpack straps allow you to carry your car seat hands-free, giving you more flexibility to carry luggage and maneuver your family through an airport. A dual zipper opening makes it easy to put in and take out your car seat and a webbing handle makes for easy lifting of the bag. 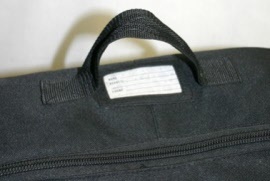 The Ultimate also features an ID card and clear ID card pocket and is made of heavy-duty fabric for durability and easy care. Packaged in a reusable storage bag. Padded wings protect a car seat's safety features. Adjustable padded backpack straps offer comfort and hands-free convenience. ID pocket with ID card and webbing carry handle.